My second LEGO Ideas submission. 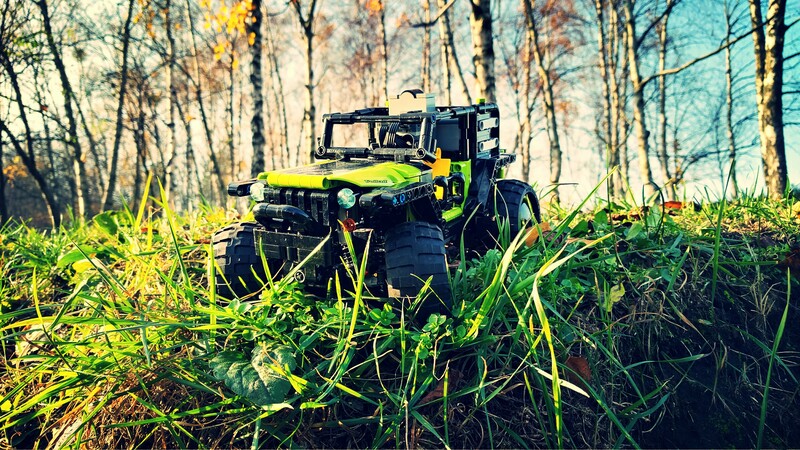 Features suspension, 4×4 drive and steering, opening doors and custom stickers. My second, very modest LEGO Ideas submission (can be voted on here). By design very small and simple to the point of being crude. Having seen a bunch of large, complex and ambitious Technic submissions fail on LEGO Ideas, I thought that maybe a very small and simple 4×4 RC crawler with suspension could stand a chance. 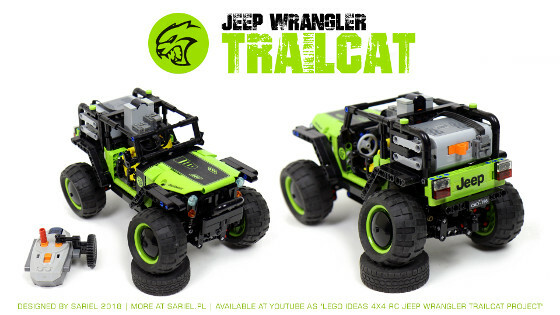 After all, it’s been 6 years since LEGO released the 9398 4×4 Crawler and the recent 42065 Tracked Racer set has shown that the market has room enough for small LEGO RC sets. The model was really modest and full of arguable compromises that felt necessary to me. 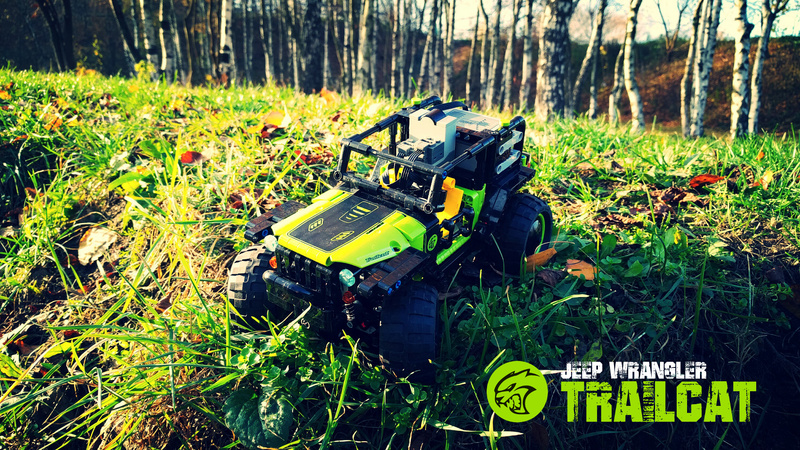 It started as an experiment, first with a very small oscillating axle suspension, then with a very small 4×4 crawler chassis. 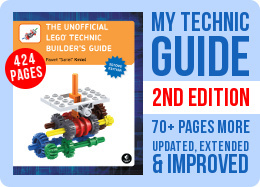 I was looking for something to replace Lego differential, which is a fairly large piece, and decided that in a lightweight model propelled by fast motors, a worm gear is acceptable. 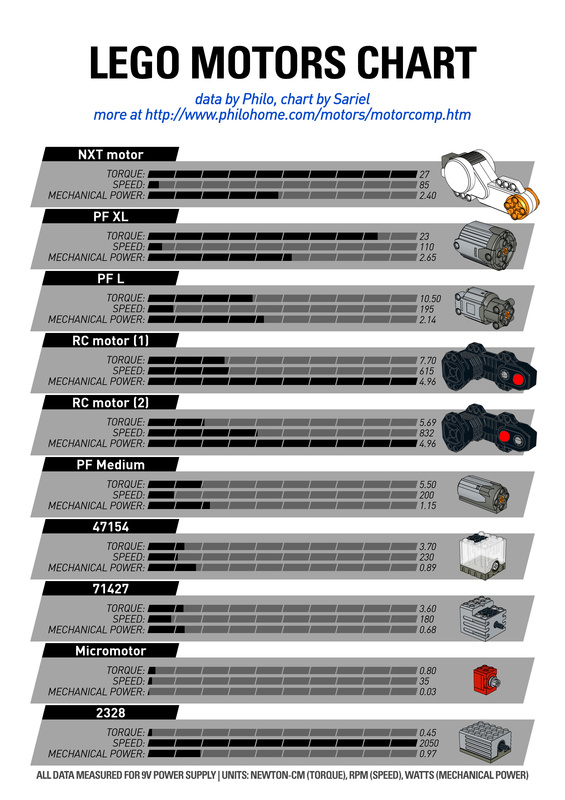 Using worm gears reduced the height, width and overall complexity of the axles drastically, prevented the model from having to brake with motors when on an incline, and – perhaps most importantly for me – eliminated the torque effect. Torque effect is what happens when the friction between the longitudinal driveshaft and the final gear makes the chassis tilt left/right when starting to drive forward/backward. Using worm gears eliminated this effect completely, which not only made the model more stable, but also allowed to use oscillating axles with very soft shock absorbers (since the absorbers didn’t need to handle the torque effect), resulting in a simple but highly responsive suspension system. The model was propelled by two PF L motors with a single PF M motor for steering. It was certainly not a perfect combination, but it was pretty much the smallest possible one, although two PF L motors were probably an overkill and a single one would do. The chassis was connected with the oscillating axles using small Technic turntables, and an empty differential was used to transfer steering over the driveshaft – incidentally, just like it did in my Jeep Wrangler Rubicon model long ago. I’ve decided to use the big PF battery box because it’s probably the only kind of a battery box LEGO is willing to put in a Technic set. The resulting model was very stable and had massive torque, but it was also suffering from bad weight distribution (most weight in the back because of the big battery box), small size (it could handle obstacles that were large relatively to its size, but it was just too small for some obstacles) and the poor worm gear / 8t gear combination that would cause the 8t gears to wear down under prolonged high stress. Like I said: compromises. 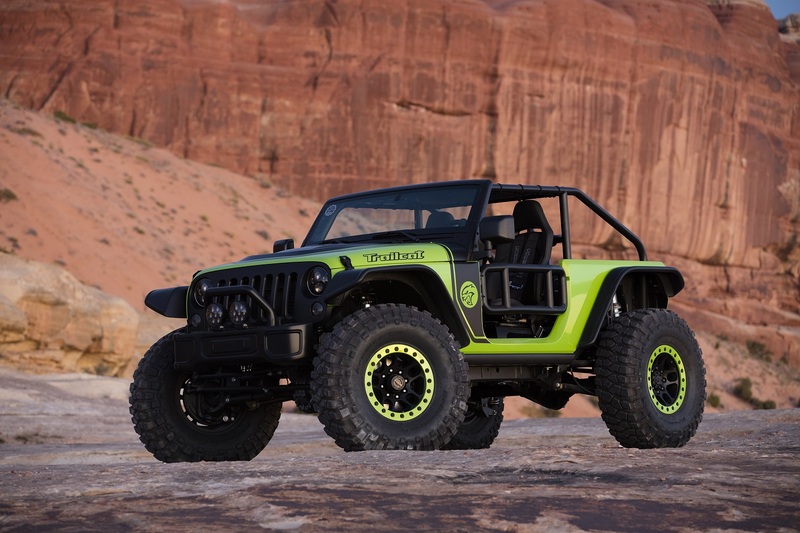 A word on the original Trailcat: it’s a crazy Jeep Wrangler version equipped with a 707 HP engine taken from Dodge Hellcat. 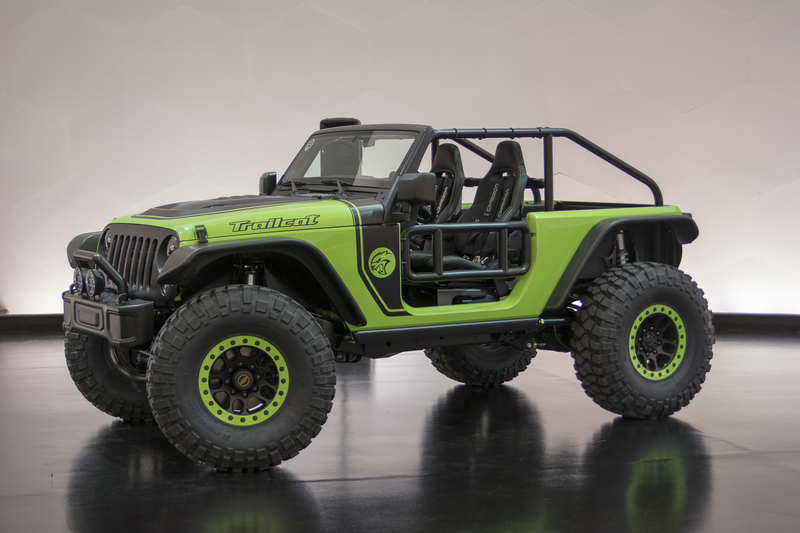 The Wrangler’s frame had to be extended to allow for the engine to fit, the suspension was raised, and the chassis was equipped with lots of upgrades and massive wheels. Also, it was lime with black, which made me instantly fall in love with it 😉 All in all, it’s a car for crazy people, hailed as “the most primitive modern can in America”. 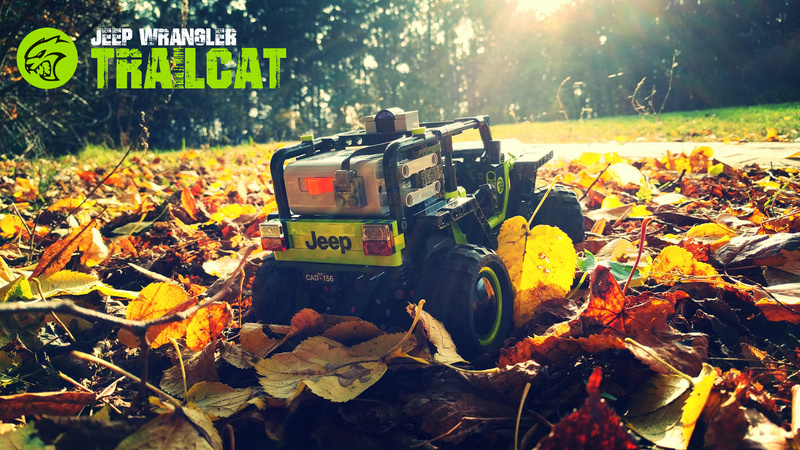 I felt regret that I had to compromise so much in my project, but a larger, more expensive submission would be probably less likely to get approved, and the Trailcat’s essence: the playability, the ability to negotiate terrain and the lovely lime – were preserved in a sufficient manner, I hope.